President of Azerbaijan Ilham Aliyev has congratulated President of the Hellenic Republic Prokopis Pavlopoulos. 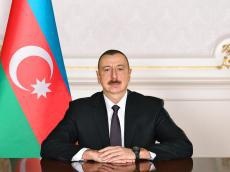 "On my own behalf and on behalf of the people of Azerbaijan, I sincerely congratulate you and the whole people of your country on the occasion of Independence Day," President Aliyev said in his congratulatory letter. "On this remarkable day, I wish you the best of health, successes in your activities, and the friendly people of Greece lasting peace and prosperity," added President Aliyev.